Learn how to make Eggless Chocolate Mousse Cake with a simple step-by-step video tutorial. 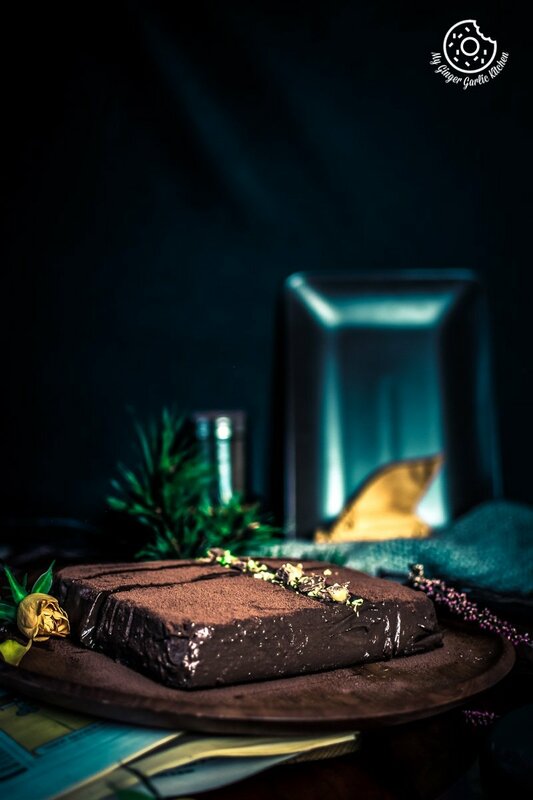 This decadent, silky, sinfully delicious, rich, melt-in-mouth, no-bake and eggless, chocolate mousse cake is all you need this festive season. 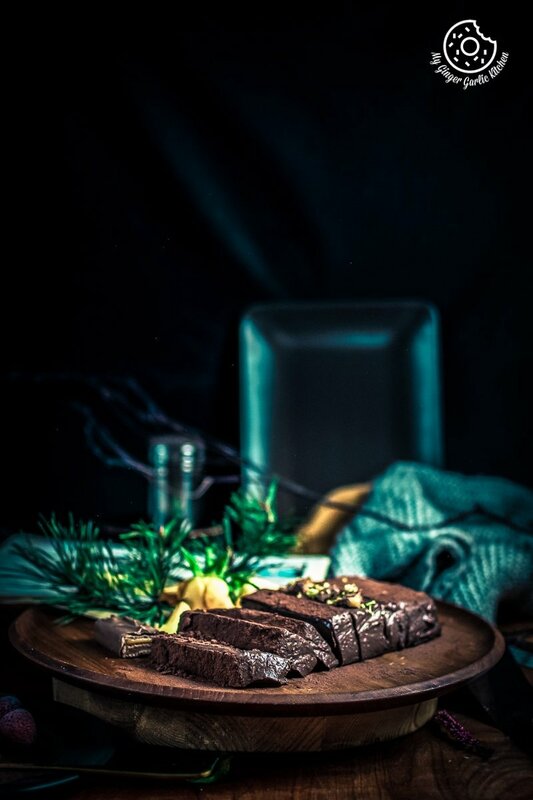 A vegetarian and gluten-free chocolate mousse cake which is eggless and completely flourless. This cake does not have gelatin, no butter either. What else could we ask for in a pretty looking cake? Mousse means foam in French, and this eggless no-bake version of mousse cake surely makes this mousse perfectly foamy and smooth. You will definitely fall in love with it after taking the first bite. 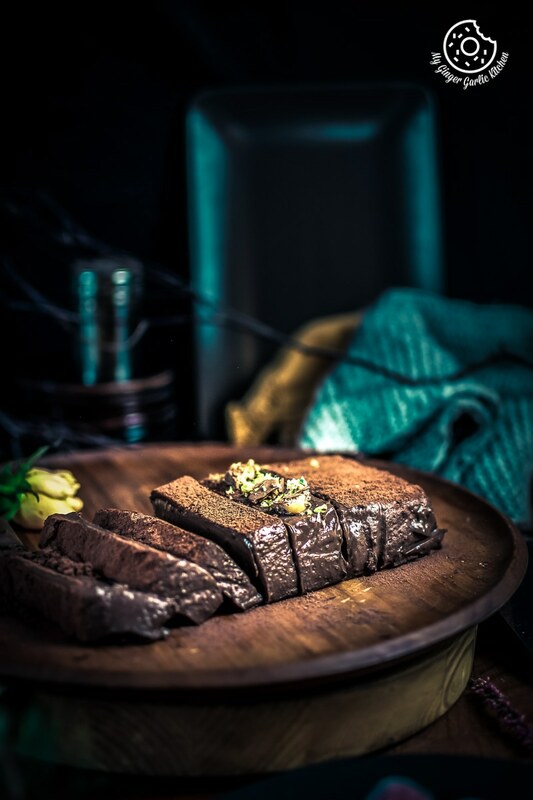 Plus, this quick and simple recipe for a creamy eggless chocolate mousse cake is easy to follow. 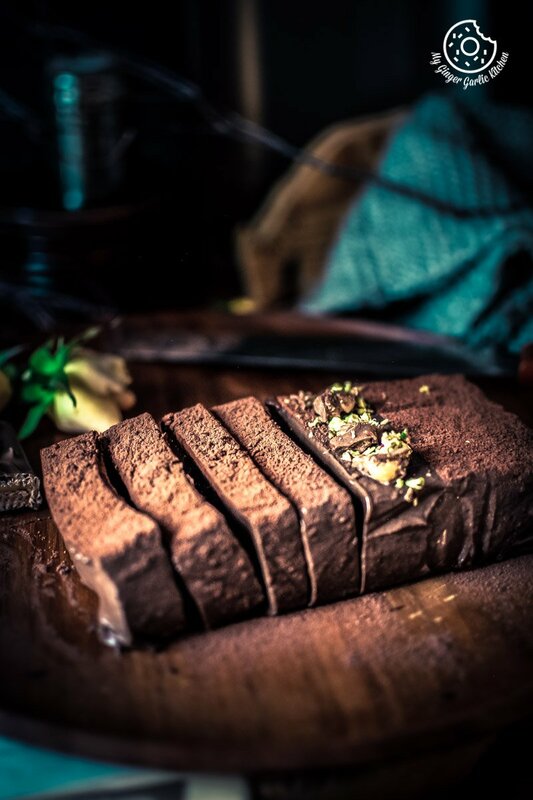 This pretty cake comes with a beautiful dressing of cocoa powder, some nutty pistachios, and chocolate candies. You won’t believe that this delicious mousse cake uses only a few ingredients and it reaches from cupboard to table with just a tiny effort. This is one of those deliciously decadent desserts that everyone will rave about. So make this cake for parties or get-togethers. Your guests will be completely impressed by this dessert. The preparation of this eggless chocolate mousse cake is really trouble-free. The cooking process requires only stirring ingredients, straining, little cooking and refrigerating. DONE! Could a chocolate mousse cake get any simpler? 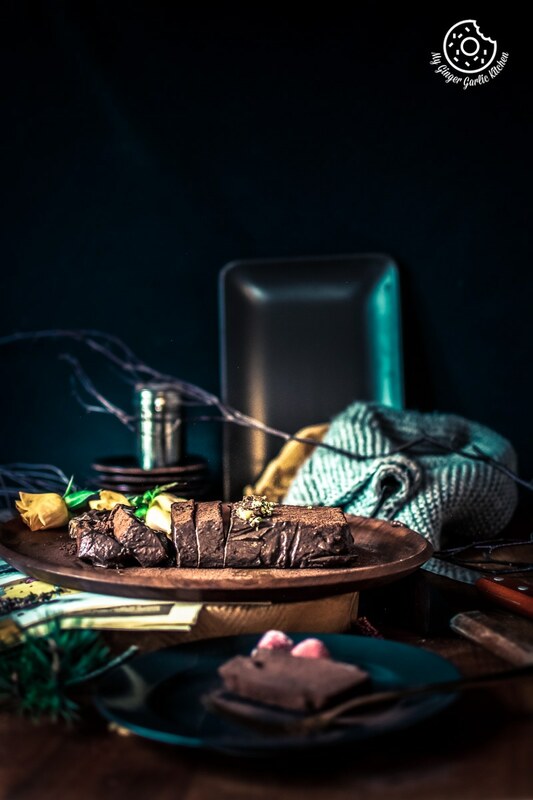 🙂 Not to mention that this effortless creamy chocolate mousse cake is so delish that I am sure you will definitely make it over and over again. What is chocolate mousse cake? A chocolate mousse cake from scratch is usually made from egg whites and/or whipping cream with different flavorings. The egg mixture or whipping cream is beaten until light and fluffy. Then it is flavored with chocolate. 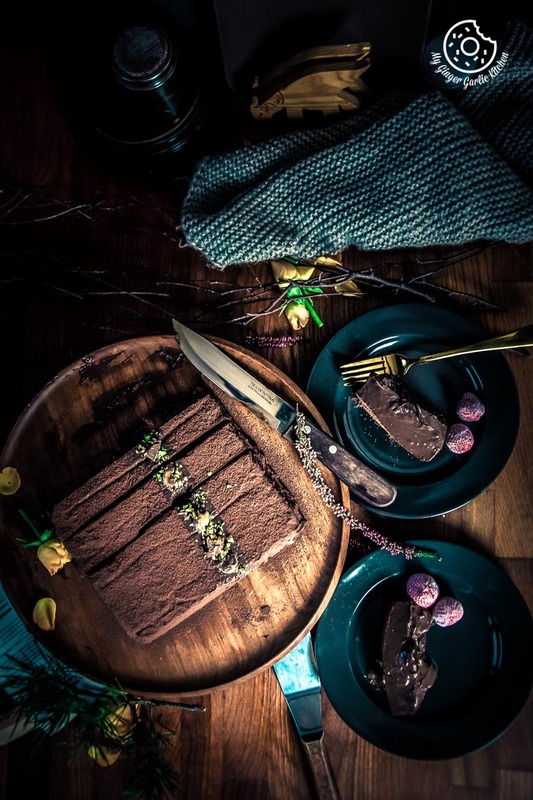 How to make eggless chocolate mousse cake? 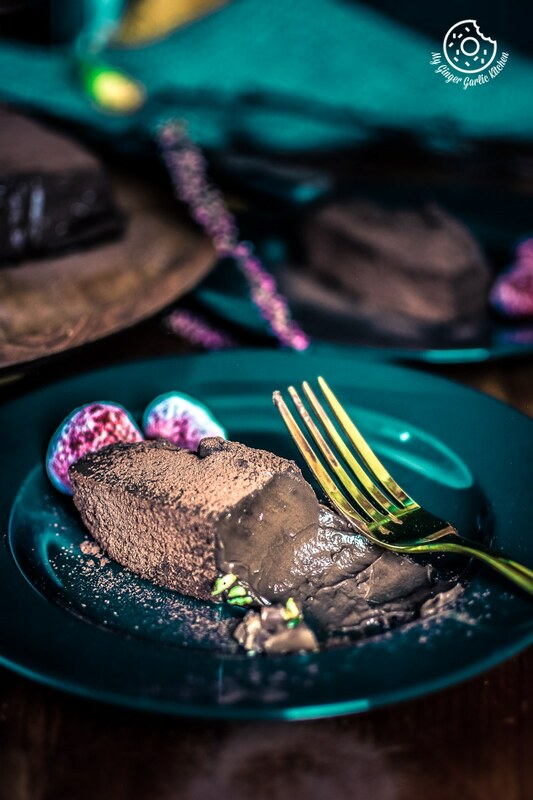 This eggless chocolate mousse cake is easy to make and takes little time and effort. Here’s the process in brief. Then you stir everything well to combine. Pass it through a sieve and cook this mixture over medium heat until it comes to a soft boil. Add dark chocolate, and keep stirring and cooking until the mixture is thickened. It thickens very quickly after adding chocolate so keep an eye on it. Keep the pan/pretty glasses/bowls/ or jars ready. Pour this hot mixture. Let it cool completely at room temperature. Cover and refrigerate for at least 6 hours or overnight. After refrigeration, take the cake out of the pan by flipping it on a board or cake stand. Dust with cocoa powder. Garnishing with pistachios, and chocolate candies are optional. Slice this cake using a hot knife for a fine touch. Enjoy! How long can you keep chocolate mousse cake in the fridge? This chocolate mousse cake can last for about 3-4 days in the fridge when kept covered. 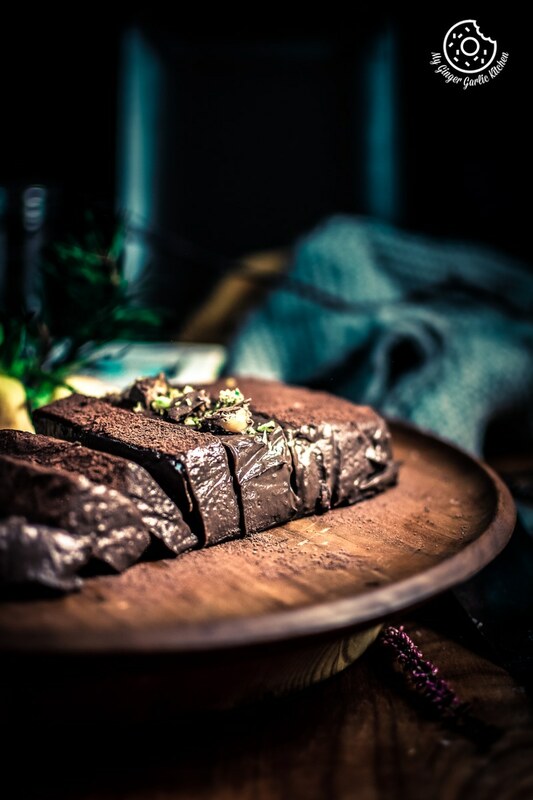 I have used a square pan, but you can use any other shaped pan for making this eggless chocolate mousse cake. You can also use mini cheesecake pan for individual servings. This looks so presentable and gorgeous. You can absolutely use a muffin tin for making single serving chocolate mousse cake. I have used 125ml whipping cream for this recipe, but you can also add lesser cream. The idea of adding whipping cream to this mousse cake is that whipping cream actually works perfectly to thicken and stabilize the mousse in the absence of eggs. With this recipe, the mousse will set perfectly, so taking it out of the pan would be a cake walk. This cake recipe is perfect for those who are not comfortable with eating raw eggs and are always worried about salmonella. To make it feel a little less greasy in taste, I did not use any butter. This gives it an intense chocolate flavor and the perfect texture. But if you want it to taste richer, add about 1 tbsp of unsalted butter while boiling. With this approach, this mousse should come out soft, silky, smooth, and utterly delightful! 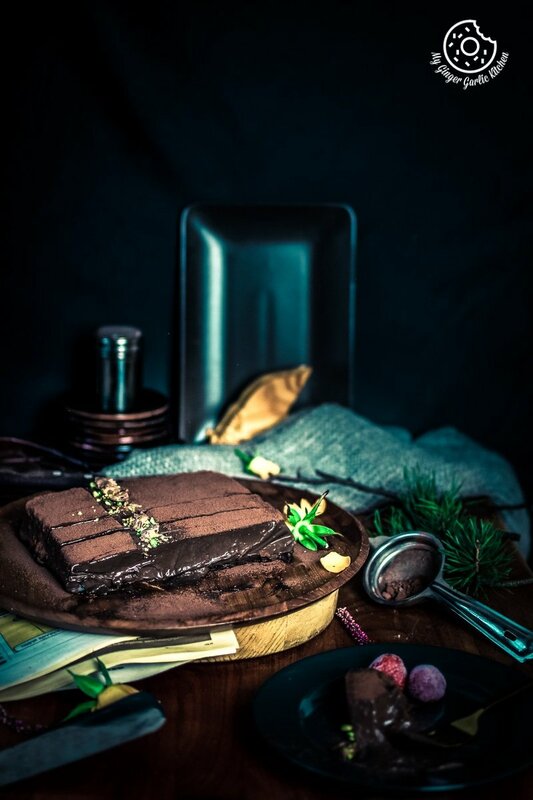 I would recommend using the finest dark chocolate for this mousse cake recipe. The best quality chocolate makes the best mousse cake. And you deserve THE BEST! his decadent, silky, sinfully delicious, rich, melt-in-mouth, no-bake and eggless, chocolate mousse cake is all you need this festive season. A vegetarian and gluten-free mousse cake which is eggless and completely flourless. This cake does not have gelatin, no butter either. What else could we ask for in a pretty looking cake? 1. Line the base and side of a heatproof cake pan with the parchment paper. 2. In a large mixing bowl add 1-liter milk, 125ml heavy cream or whipping cream, 50g unsweetened cocoa powder, 50g cornstarch, 1 tbsp instant coffee powder, 3/4 cup sugar and a pinch of salt. 3. Whisk everything well using a wired whisk. 4. Strain this the mixture through a sieve into a pan. 5. Cook this mixture on medium heat and let it come to a soft boil. (Keep Stirring occasionally). 6. Add 300g dark chocolate and keep stirring and cooking until the mixture is thickened. It thickens quickly after adding chocolate so keep an eye on it. 7. Pour this mixture into prepared pan and gently tap it to remove the air bubbles. 8. Let the chocolate mixture cool completely at room temperature. 9. Refrigerate it for at least 6 hours or overnight to set. 10. After refrigeration, take the cake out of the pan by flipping it on a board or cake stand. 11. Before serving dust the top of the cake with cocoa powder. 12. Garnishing with pistachios, and chocolate candies, and/or with fresh berries if desired. 13. Slice this cake using a hot knife for a fine touch. Serve. 1. You can use dark chocolate chips instead of the dark chocolate bar. 2. 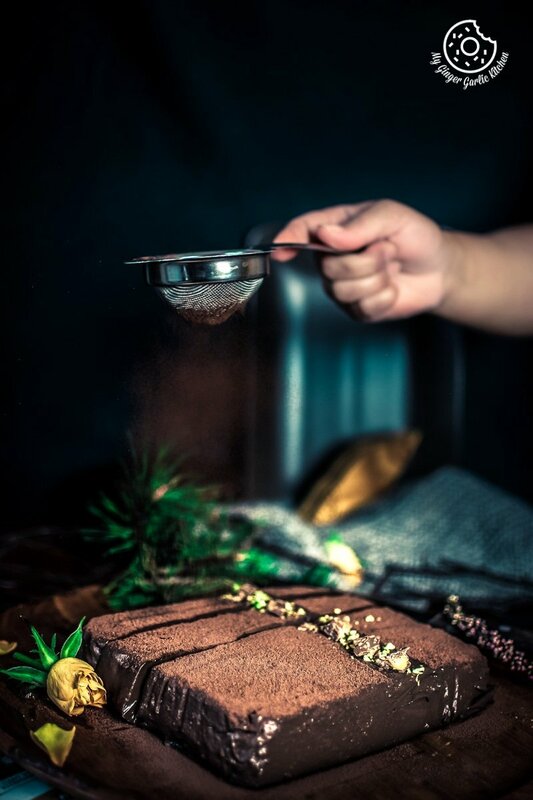 Coffee powder enhances the chocolate flavor in this chocolate mousse cake. However, you can skip it if you don’t like the taste of coffee in your chocolate mousse cake.